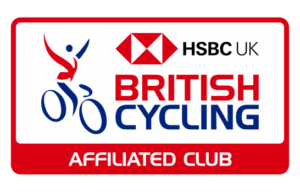 Autumn’s here – it really is, starting Sunday 23rd September this year – so it’s on to mainly winter cyclo cross and hill climbs but with TTs still to finalise. 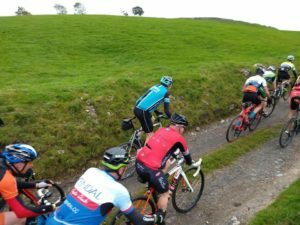 The last race in the 2018 YCF Sporting Courses (SpoCo) Series, the Harrogate Nova CC 10, was held Saturday 29th September on the V212 course on the A168, the HQ at Arkendale Village Hall. 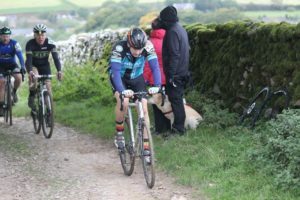 The late season event saw a full field of 120 riders plus 7 reserves, Claire and Greg Jessop riding for Otley. Claire was the fastest of the pairing, finishing in 27:02, Greg in 27:49. Amazingly, the other Greg in the event, Greg Elliot of Harworth and District CC, the former club of Tom Simpson, also finished in 27:49. The event was won by Junior rider Harry Lee of Wold Top Actif RT in 20:28. Fastest woman was another Claire – these coincidences keep on coming – Claire Swoboda of VC St Raphael in 24:38. 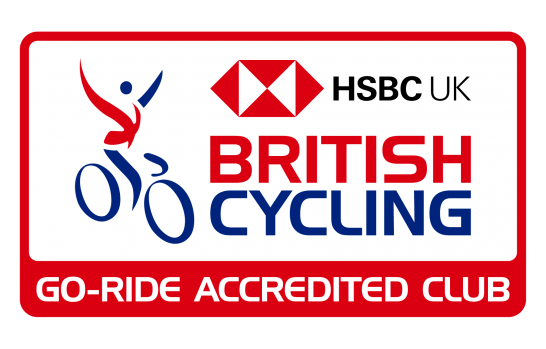 Full results and report courtesy of CTC and Snowdon Sports. As mentioned, this was the last event in the 2018 YCF SpoCo series, the final table seeing Claire Jessop in 3rd place in the Women’s competition with 701 points and Helen Goldthorpe in 5th with 576. Final results courtesy of Phil Hurt via the YCF Facebook page here. 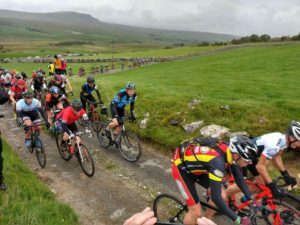 The hardest ‘cross race in the UK, if not the world, the 3 Peaks Cyclo-Cross takes place in Yorkshire – where else! – every September, the 2018 edition held Sunday 30th September. Photographs courtesy of Helen Goldthorpe, Liam Mealey, both of who marshalled at the event, and Morgan Leeming-Sykes. 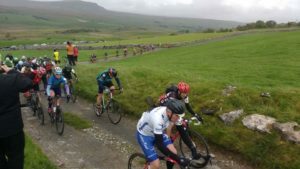 Taking in Ingleborough, Whernside and Pen-y-ghent, the route covers 38 miles and attracts in excess of 500 riders. This year Andrew Moxon, James Cullen and Steve Renshaw were representing Otley CC. On what was to be a dry but cold day Andrew finished in 4:37:49, 84th MV50, 361st overall and James in 4:46:08, 96th MV50, 398th overall. Steve was unfortunately a non-starter due to a chest infection. Paul Oldham of Hope Factory Racing was 1st overall in 2:56:06. Women’s winner in 3:45:19 was Christina Wiejak of Barrow Central Wheelers. Full results courtesy of the 3 Peaks Cyclo-Cross website. 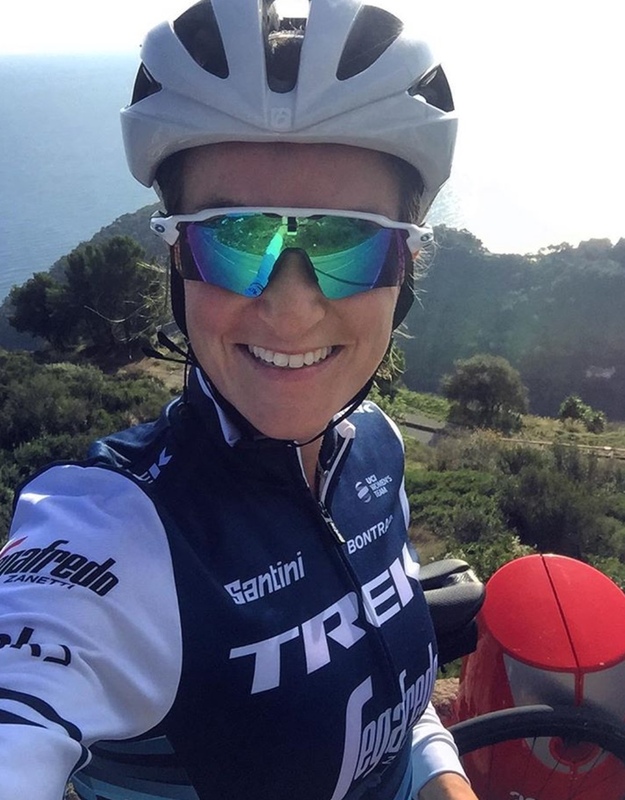 Starting later the same day, Amy Cuthbertson rode her second hill climb of the season, the West Pennine Road Club hill climb on the L823 Blackstone Edge course based at Littleborough in Greater Manchester. This should have been Amy’s third hill climb but the 3RT event due to be held Sunday 16th September had to be postponed until Sunday 4th November due to the course not being available on the original date. Amy covered the 2.1 mile course in 11 minutes 43.8 seconds. Fastest overall was Martyn Stewart of East Lancashire RC in 7:51.4 with Team Sportslab’s Sarah Lewthwaite fastest woman in 10:35.2. Full results courtesy of CTT. 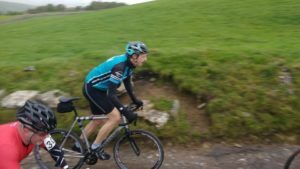 It’s of course our own Open 2 Stage Hill Climb on Saturday 6th October, organised by Andrew Bolton, details of which can be found on the CTT website here.